Dry skin in felines is a fairly common problem, especially in climates where the winter months bring colder temperatures. If the skin appears red, irritated or infected, it is always wise to seek advice from your veterinarian before trying any at-home treatments. However, if the cat is simply exhibiting some itchiness and extra dander, there are a few home remedies for dry skin that are fairly simple to try. Jojoba oil is one treatment option for felines with dry skin. In addition to healing dry skin, it also protects cats from fleas, ticks and many types of mites, and provides a healthy luster to the coat. It also treats hot spots that sometimes occur as a result of dry skin that has been left untreated. Jojoba oil is natural and nontoxic. Apply the oil with your fingers or a small sponge, and massage deep within the fur so it will penetrate the skin. Many cat owners notice a significant difference after one or two treatments. Their cats are producing less dander and doing much less scratching. Brushing your cat frequently and thoroughly is another remedy for bouts of feline dry skin. 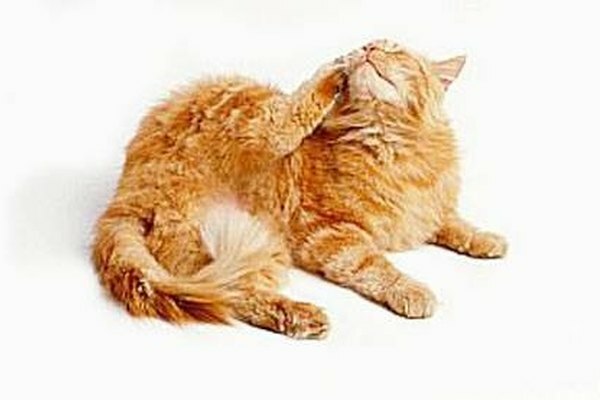 Since brushing stimulates the body's natural oils, this is often one remedy that helps the cat cure itself without the aid of any topical products. Since cats bathe themselves every day, refrain from bathing your cat. While some people think that a bath may help feline dry skin, it actually exacerbates the problem. Don't ever use products designed for human beings to alleviate feline dry skin. It seems harmless, after all, so some cat owners consider such options. We treat our own dry skin with lotions, creams or oils and it makes us feel better rather quickly. These same products, however, can make feline dry skin even worse, by clumping the skin and trapping unnecessary oils near the skin's surface. Be sure that your cat's food is providing the necessary nutrients to prohibit dry skin. The upper-end foods like Iams and Science Diet are rich in nutrients that keep skin oils at a healthy level. Water is vital to both treating and preventing dry skin in felines, as they require proper hydration for good overall health. Vitamins and supplements containing fatty acids will help alleviate feline dry skin. While these are readily available as over-the-counter options in most pet supply stores, it is a good idea to check with your veterinarian before starting your cat on a vitamin or supplement regimen. Most of these remedies are simple and harmless options for treating feline dry skin. However, like human beings, animal's bodies often display seemingly harmless symptoms that may be signs of more serious underlying conditions. If these easy options don't alleviate your cat's dry skin within a very few days, consult your veterinarian for advice in case the dry skin is masking a more serious ailment.